To be used to attach zig zag springs, edge springs and torsion springs to border and edge wires (up to - 2x 4mm/8g wire). Osborne lined BW Clips won't squeak due to its paper coating. Solid steel construction. 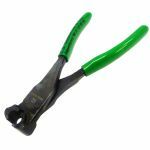 Osborne #522 BW Clip Pliers are specially designed for closing BW Clips.